This is the first article in an occasional series on interesting database technologies oustide the (No)SQL mainstream. I will introduce you to the core concepts of these DBMS, share some thoughts on them and tell you where to find more information. All jokes aside, I hope you’ll enjoy these. Let’s get started. Datomic is the latest brain-child of Rich Hickey, the creator of Clojure. It was released earlier this year and is basically a new type of DBMS that incorporates his ideas about how today’s databases should work. It’s an elastically scalable, fact-based, time-sensitive database with support for ACID transactions and JOINs. A novel architecture. Peers, Apps and the Transactor. A powerful, declarative query language, “Datalog”. The Datomic team wants its DBMS to provide the first, “real” record implementation: records in the pre-computer age preserved information about the past, whereas in todays databases old data is only overwritten with new. Datomic changes that, and preserves all information, differentiating between information by making time an integral part of the system. 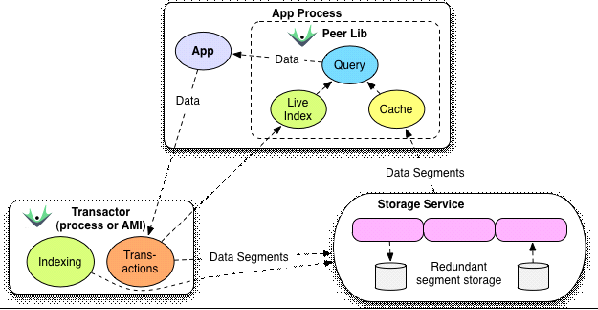 The single most revolutionary thing about Datomic would be its architecture. Datomic puts the brain of your app back into the client. In a traditional setup, the server handles everything from queries and transactions to actually storing the data. With increasing load, more servers are added and the dataset is sharded across these. As most of todays NoSQL databases show, this method works very well, but comes at the cost of some “brain”, as Mr. Hickey argues. The loss of consistency and/or query-power is a well-known tradeoff for scale. To achieve distributed storage, but with a powerful query language and consistent transactions, Datomic leverages existing scalable databases as simple distributed storage services. All the complex data processing is handled by the application itself. Almost as in a native desktop application (if you can remember one of those). Every peer manages its own working-set of data in memory and synchronizes with a “Live Index” of the global dataset. This allows the application to run very flexible queries without the need for roundtrips (more on that under “Criticism”). But so far, we’ve only got back query power. To also re-enable consistent transactions, Datomic takes a step further: it makes the storage service read-only and forces all writes through a new kind of architectural component, the “Transactor”. The first statement is true for some read-operations, but I couldn’t find a hint as to how the Transactor handles reads in transactions. Though it is mentioned that “Each peer and transactor manages its own local cache of data segments, in memory”, which would require perfect cache synchronisation. Otherwise consistency is only guaranteed for one peer, which quite frankly is pointless. Hopefully, this management overhead won’t neutralize the promising ACID capabilities and the performance gains of in-memory operations. What happens when one Transactor faces too much load? The Datomic team would like to avoid sharding, but wouldn’t exactly that be necessary at some point? Also, even if we pretend that the number of transactions wouldn’t increase with more peers, the time it takes to transmit changes to all of them sure does. In conclusion, the Transactor could be an amazing thing to have with smaller datasets but may become a potential performance bottleneck or Single Point of Failure. … plus a few more. Storage service support could be one big reason to try out Datomic, but unfortunately, only the temporary local storage is available for Datomic Free users (aka users who aren’t willing to pay $3,000+ for a brand new DBMS). All in all, the Datomic architecture comes with loads of innovative ideas and potential benefits, but its real-world applicability remains to be proven. Please read the detailed architecture overview in the Datomic documentation or watch this 20 minute video by Mr. Hickey himself. Datoms are highly reminiscent of the subject-predicate-object scheme used in RDF Triplestores. These attribute definitions are the only type of schema implied on the dataset. In a relational database, this would be represented as a 12000 at the “john”-row in the “balance” cell (data is place-oriented). If now, a month later, John’s balance changes to 6,000, this specific cell would be wiped, and the new value would be put in. The fact, that John had 12,000 on his account a month ago is gone forever. One of the main reasons for the creation of Datomic was the feeling, that today’s hardware is finally able to keep true records of data, something no other popular DBMS to date does. Datomic never updates data, it simply writes the new facts and keeps the old ones. This paves the way for lots of interesting, time-sensitive queries. Facts are never lost. If John is interested in his current balance, he queries for the most recent Datom. But nothing would prevent him to query his complete balance-history anytime he wants. Besides, Datoms are, as the name implies, atomic, the highest possible form of normalization. You can express your data-model in as many entities as you want, the bigger picture is automatically constructed via implicit JOINS. Such flexibility allows Datomic to function as almost anything, for example a complete graph API. Rules are “fact-templates”, which all facts in the database are matched against. This syntax will probably take some getting used to (except you’re familiar with Clojure), but I find it to be very readable and, as the Datomic Rationale promises, “meaning is evident”. For more information on the query – syntax, please refer to the very good documentation and this video. ● Facts are time-sensitive. This is quite interesting for analytics. Status messages, tweets or prices could also be stored much more naturally with regard to their dynamic nature. Also, since this DBMS was explicitly constructed to provide “real” records, everything record related should be an obvious fit. In general, Datomic’s time-sensitive layer provides an interesting twist to your existing dataset. It can be used as a normal DBMS, with an additional dimension of insight. Imagine your e-commerce database including the complete price-history of every item and the engagement history of every customer. Wouldn’t it be fascinating to get a quick answer for otherwise complex questions? “When did this product became popular? – Oh it was after the 10$ price-drop.” “When did this customer started using the site every day? – That was two months ago, here is a graph of his daily time-on-page increase”. ● Separation of data and processing. All required data has to be moved to the client application, before it can be processed/queried. This might pose a problem once you get to larger datasets. Local cache will also inevitably constrain working-set growth. Once this upper-bound is passed, round-trips to the server-backend will be necessary again, with even bigger performance penalties. The Datomic team expects it’s approach to “work for most common use cases”, but this can’t be verified at this early stage. ● Sharding might not be necessary for the read-only infrastructure, but the Transactor will need some type of sharding mechanism, once it has to deal with heavy loads. ● The Datomic Pro pricing is quite restricting, and considering that Datomic Free is no good for any kind of production use, building some experimental projects will be pretty hard for the average developer. Alex Popescu wrote a great post on Datomic, focusing on these critical points and some more. I personally think that many of the concepts and ideas behind Datomic, especially making time a first-class citizen, are great and bear a lot of potential. But I can’t see me using it in the near future, because I’d like to prove some of the team’s performance claims for myself, a desire not in keeping with my finances relative to a Pro license. Otherwise, some of Datomic’s advanced features, like fulltext search, multiple data-sources (besides the distributed storage service) and the possibility to use the system for local data-processing only, could potentially be useful. Please share any thoughts you might have in the comments!